Pavlova, the favorite dessert of Australia and New Zealand, consists of a meringue shell that is crispy on the outside and soft on the inside, cradling a filling of whipped cream and fruit. It was named in honor of the Russian ballerina Anna Pavlova, famous at the time for her beautiful dancing. Apparently the dessert was as light and lovely as Anna herself, who toured New Zealand in the late 1920s and Australia in the mid 1930s. This version features poached strawberries and whipped cream sweetened with lavender sugar, an easy-to-make combination of granulated sugar and dried lavender ground to a fine powder. You might wonder why anyone would bother to poach strawberries, since they are so delicate in their fresh state. The heat from the poaching syrup softens their flesh, making them meltingly tender so they practically dissolve in your mouth. The poached berries meld beautifully into the soft cream and marshmallow-like meringue in this very special dessert. 1 Make the meringues: Preheat the oven to 250°F and position an oven rack in the center. Use the fine-mesh strainer to sift 2 tablespoons of the sugar and all the cornstarch into the small bowl. Place the egg whites, cream of tartar, and salt in the bowl of the stand mixer and whip on medium-high speed for 1½ to 2 minutes, until soft peaks form. You can also use a hand mixer and a medium bowl, although you may need to beat the mixture a little longer at each step to achieve the same results. Add the vanilla and, with the mixer running, slowly rain in the remaining sugar. Turn the speed to high and whip until the meringue is very stiff, 30 to 45 seconds. Sift the sugar-cornstarch mixture over the meringue and gently fold it in with the spatula just until blended. 2 Line the baking sheet with parchment paper or a silicone mat. Gently spoon meringue into the ¹⁄³-cup measuring cup, level the top, and use the spoon to help turn it out onto the baking sheet. Create 7 more portions in this manner, spacing them evenly. Use the back of the spoon to make a well in each meringue. The finished meringues should be about 3 inches wide and 1 inch tall. 3 Bake the meringues for 50 to 55 minutes, until faintly golden and crispy on the outside. The interior will still be soft and fluffy. Transfer to a rack and cool completely. 4 Poach the strawberries: Wash the berries and pat dry. Hull each berry using a strawberry huller or the tip of a paring knife. If the strawberries are large, cut them into quarters or ¼-inch thick slices. Place the water and sugar in the medium saucepan and bring to a boil. Simmer for 1 to 2 minutes, until the sugar is completely dissolved. Carefully transfer the berries to the syrup and bring back to a simmer. As soon as the syrup begins to boil again, remove from the heat and cover the pot. Let the berries sit in the syrup until the mixture is room temperature, about 30 minutes—they will poach in the residual heat. 5 Make the honey-lavender cream: Place the sugar and lavender in the spice or coffee grinder and grind until the texture is very fine. Transfer to the small bowl. Place the cream, honey, and 1 ½ tablespoons of the lavender sugar in the cleaned bowl of the stand mixer and whip until the cream holds soft peaks (save the remaining lavender sugar for another use). You may also use the cleaned hand mixer and medium bowl here. Cover with plastic wrap and refrigerate for 30 minutes to allow the flavors to blend. 6 Assemble the Pavlovas: Use the slotted spoon to scoop the strawberries from the poaching liquid and drain slightly on paper towels. (Save the poaching syrup for flavoring sparkling water or use it for a refreshing twist in your favorite cocktail.) Place a meringue on each serving plate. 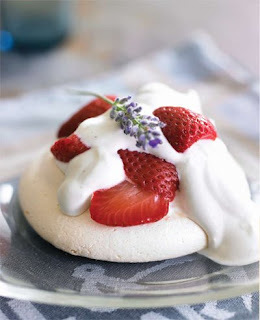 Fill the center of each meringue with honey lavender cream and top with 4 or 5 strawberries. Garnish with some fresh lavender and serve immediately. Be sure you purchase dried lavender from a culinary source such as the bulk department of a health food store or a specialty herb supplier, so you can be sure the flowers were not treated with harmful chemicals. Flowers grown for commercial and potpourri use are laden with pesticides and should never be used in cooking or baking. The meringues can be baked up to 3 days in advance and stored in an airtight container at room temperature. The strawberries can be poached up to 2 days in advance and refrigerated in the poaching syrup. The lavender sugar can be prepared up to 1 month in advance and stored airtight at room temperature. The honey-lavender cream can be prepared up to 3 hours in advance and chilled in an airtight container.